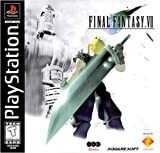 Final Fantasy VII for Playstation Costs a Minimum of $58.95 USED!! Copies of Final Fantasy VII, including the Greatest Hits version, have been selling on Amazon for $58.95 to $165.00. Prices on EBay have been only slightly better. I picked this classic game about a year after its release, used, for 15 bucks at my local game store. Now it sells for up to $500.00 new and can't be found for less than $100(new) on Amazon. All I can say is buy your ps1 games now because they are crossing the line from "old" to classic. Final Fantasy VII no longer an "old PS1 game"
I picked this classic game about a year after its release, used, for 15 bucks at my local game store. Now it sells for up to $250.00 new. All I can say is buy your ps1 games now because they are crossing the line from "old" to classic.